Sometimes it takes a lot to squelch a seemingly irresistible urge to over complicate things. But that's exactly what Ascend Communications did at its production plant in Alameda, CA. Better yet, that approach has paid off for this fast growing manufacturer of telephone network controllers. In a typical day, Ascend builds hundreds of controllers to specific customer specifications. And even though no two controllers are alike, the company meets this complexity with a simple yet flexible manufacturing scheme, says senior manufacturing engineer Jack Russitano. 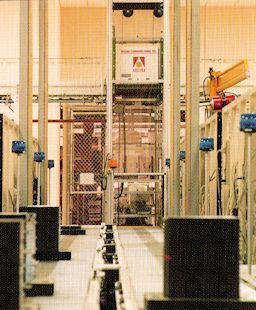 "We opted for a U-shaped conveyor line that feeds work-in-process to multiple workstations. In addition, workers direct pallet loads of WIP from station to station. This maximizes our flexibility to pace production and meet customer requirements at the same time," Russitano explains. 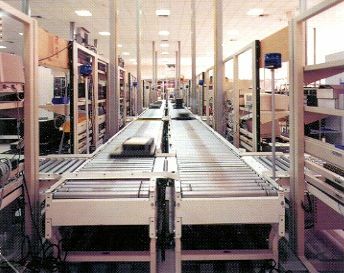 The end result is two, conveyor-based manufacturing lines that use a minimum of floor space but build lot sizes of one. On a typical day, Ascend pumps through the two lines a combined total of 600 network controllers on the busiest days. "Just as important," adds Russitano, "we can accommodate peak periods that typically occur at the end of the quarter as well as slow periods at other times, without hurting manufacturing efficiencies." The 150,000 sq ft facility in Alameda is evenly divided into three sections: manufacturing floor, storage and shipping, and offices. 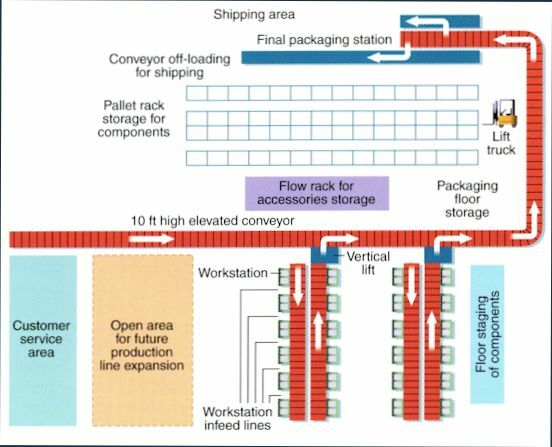 As the layout shows, manufacturing is immediately adjacent to storage and shipping, keeping travel distances for components and finished goods to a minimum. The manufacturing done on the two lines is primarily final assembly and configuration of telephone network controllers. That means nearly finished controllers arrive at the facility from contract manufacturers. Those receipts are stored on pallets and putaway by lift truck in dedicated rack locations. A separate flow rack with 120 locations positioned between the pallet rack and manufacturing lines holds accessories for the controllers. Accessories are stored by part number. Packaging materials used to ship finished controllers are floor stored alongside the flow rack. Ascend completes assembly only when orders are in hand. During the night, the company's order management system downloads the day's orders to the manufacturing control system. This initiates picking of unfinished controllers in pallet rack, accessories from flow rack, and packaging materials from the floor. Controllers are transferred from counterbalanced lift trucks to pallet trucks for delivery to a staging area behind the first workstation on the two lines. Pallet trucks also move picked accessories to designated staging areas behind workstations. Packaging materials are moved to an area behind the final workstation on the lines. In general, one manufacturing line is dedicated to a single model while the other builds nearly 10 different models. With both lines running, noise level on the floor is 65 decibels, says Russitano. On the line handling the single model, which weighs over 100 lbs, workers use a hoist-assisted manipulator to move the unit from the pallet load onto a slave pallet at the first workstation. Units built on the other line are light enough to be manually placed on slave pallets. On each line, there are 12 workstations, six on both sides of a line. At the first workstation, explains Russitano, a worker attaches a sales order printout to the unit on the slave pallet. That printout details each manufacturing step needed. Routing of slave pallets to individual workstations is done with a simple coding system. On the side of the pallet is a reflective slider on a numbered track. A worker simply moves the slider until it covers the number of the next workstation in the assembly sequence. A photo eye positioned just before each workstation searches for the slider. If it covers the number for that particular station, the photo eye stops that zone of conveyor, bringing the pallet to a halt. Three activities can happen next. If the workstation is empty, a worker manually activates a pop-up transfer chain that delivers the pallet into the infeed conveyor. In the second scenario, a worker slides a pallet already in the station onto the transfer chain for delivery to its next destination. Then the new pallet is transferred into the workstation. Thirdly, if no worker is at the station and the transfer chain not activated in a certain period of time, the conveyor zone reactivates and continues to carry the pallet along the line. The pallet recirculates until it gets to the designated workstation. Packaging of the finished controller occurs at the final workstation. A worker first scans the bar code on the traveler before using a hoist-assisted manipulator to place the controller in its shipping box. The scan initiates printing of a bar coded label with model and serial numbers for the shipping case. In addition, model and serial number labels are placed on the unit itself. The packed case is transferred back onto the conveyor for immediate delivery to a vertical lift which carries it to an elevated conveyor 10 ft above the shop floor. That conveyor brings finished goods, as well as cases from customer service, to the shipping station. There, the serial number on the case is scanned. This information is tied to the sales order in the system which determines the carrier that will ship the case. An appropriate shipping label for that carrier is then printed and applied to the carton. In addition, the system generates a final bar code label that includes the serial and shipment numbers as well as a listing of the contents of the case. A final conveyor segment delivers the case to the shipping dock. As Ascend's line of telephone network controllers expands, there are plans to add a third manufacturing line similar to the other two says Russitano. The system maximizes our flexibility to pace production and meet customer requirements at the same time.